It’s almost Easter. 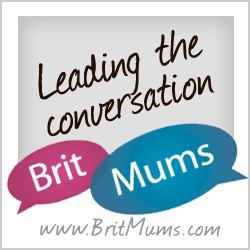 School holidays are approaching and parents all over the UK are trying to plan two weeks worth of activities and arrangements for the children. What do you normally get up to at Easter? Perhaps some Easter-themed reading books with the children? We try to do a mixture of things. 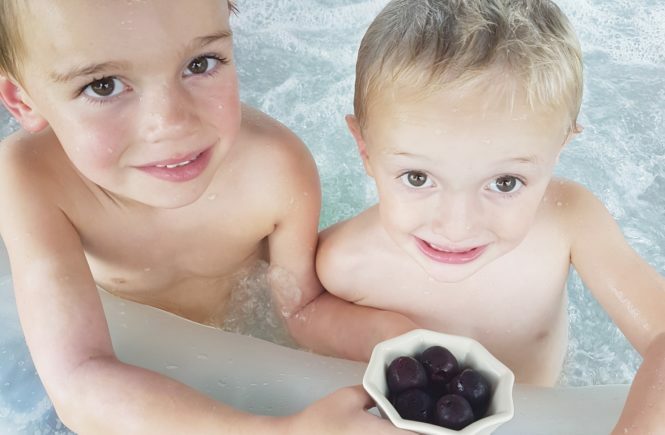 We plan to spend lots of time outside, whatever the weather decides to do, because the children are always on better form when they are outside. We plan to do lots of baking too as the little fingers in our house LOVE to bake. Probably some Easter-themed craft, and a few trips out with friends. 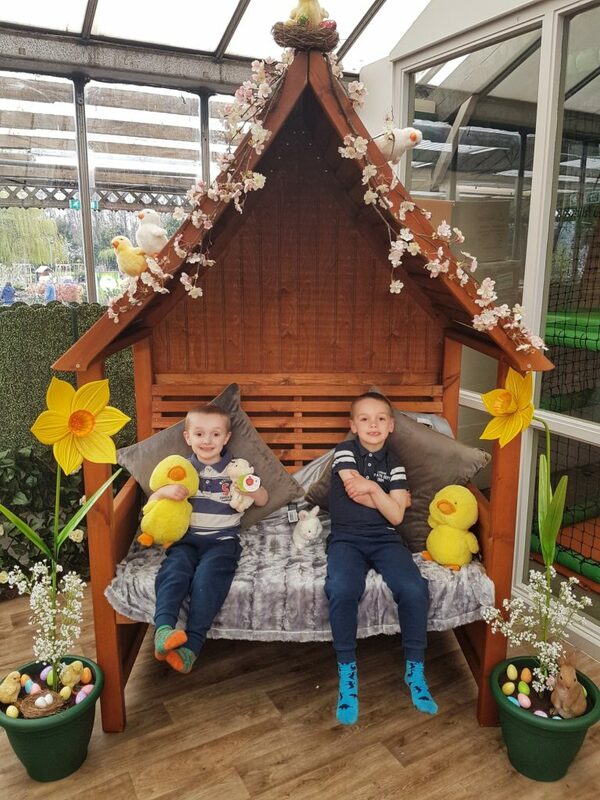 If you are looking for some Easter-themed fun over the holidays, or equally in the run up to the holidays, check out what’s going down at Wyevale Garden Centres. These centres are all over the UK, so hopefully there will be a centre somewhere near you. You and your little ones can enjoy breakfast or tea with the Easter Bunny. 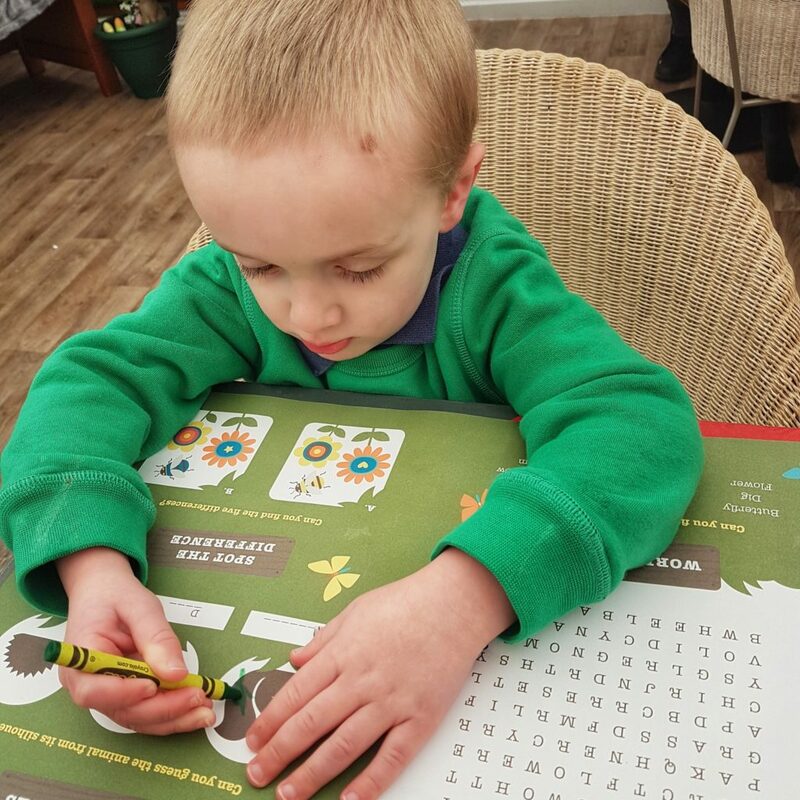 We visited Altrincham Garden Centre ahead of Easter, to see what it was all about. There is a lovely little soft play in the restaurant which the boys enjoyed running around in. As an example here are the breakfast menus – oh, and yes, that’s right, adults get breakfast too! The recommended age for children is between 3 and 8 years old, but you know your children best and what they would enjoy. All options are served with unlimited squash and the children are given colouring and activity sheets. 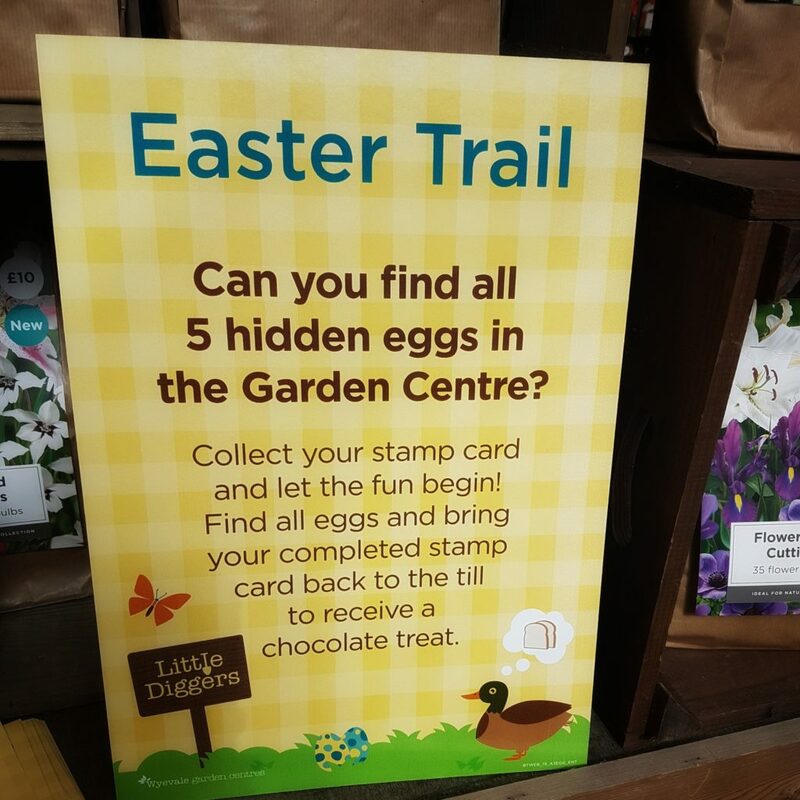 Children set off with a parent and a member of staff and a sheet of coloured card, where they must collect five stamps, which are hidden around the garden centre. Once collected the children can collect their prize of chocolate eggs back at the restaurant. At this point the children were also given an Easter chick complete with decorating kit to take home. Fear not, the Easter Bunny is here for a few high fives and a photo opportunity. 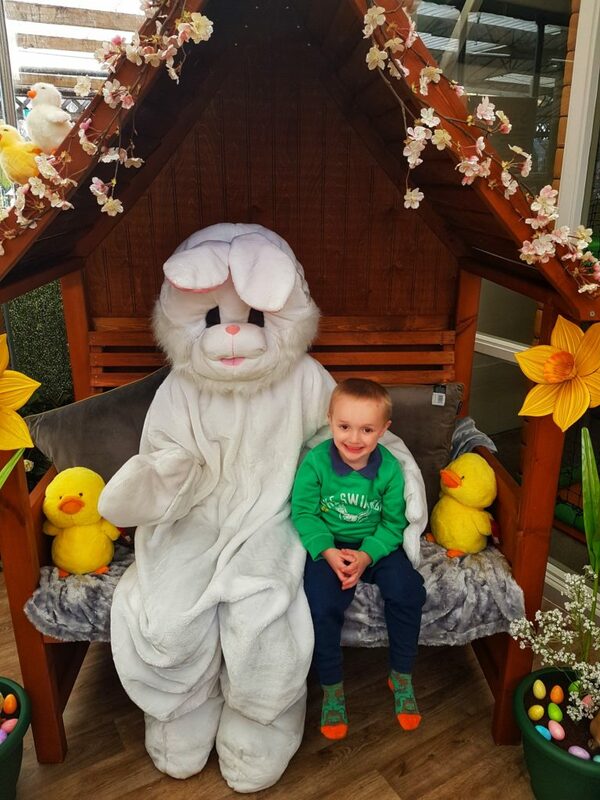 The setting was beautifully decorated and Easter themed and the Easter Bunny didn’t rush off, allowing all the children time for photos and cuddles. 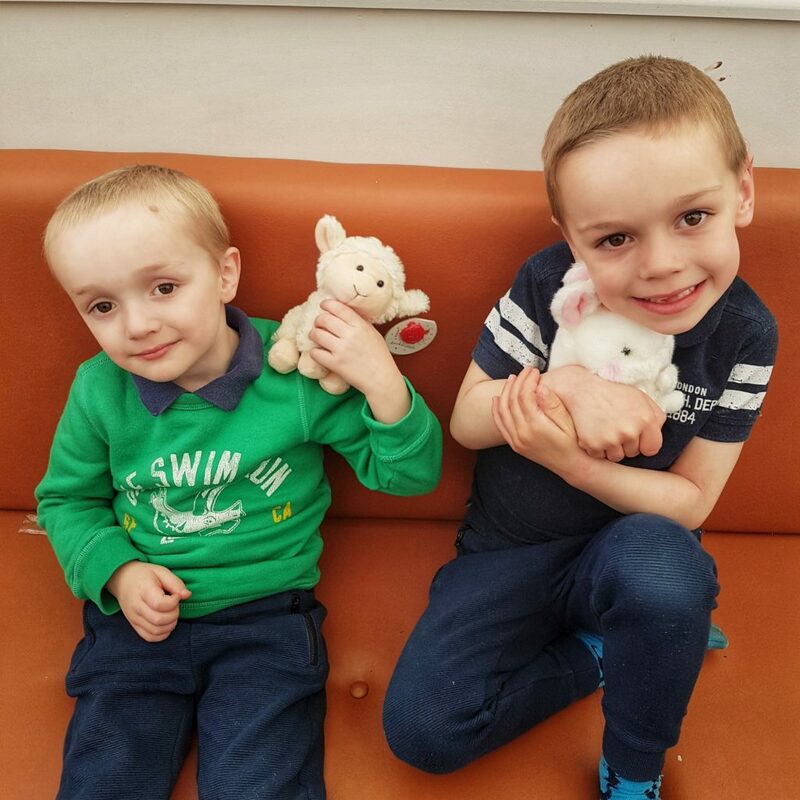 He even had a little gift for all the children – a cute soft toy! 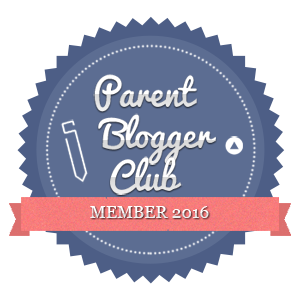 At £10.95 per child this event offers excellent value for money. The food is good quality and there is plenty available, and the gifts the children receive are really lovely too. A lovely couple of hours of family time and the garden centre itself is a really nice environment. Interested? You can book here. Good to see a special event that wasn’t massively overpriced!! Looks great for the little ones, my 11 year old wouldn’t be impressed though!